German is spoken by about 95 million people worldwide. 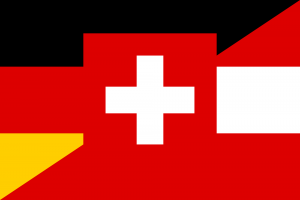 German is the only official language of Germany, Austria, and Liechtenstein; one of the official languages of Switzerland, Luxembourg, and Belgium; and a recognized minor language in many other countries, such as Italy, Slovenia, Hungary, Namibia, and Poland. German alphabet contains the same 26 letters as the English alphabet, plus the umlauted letters: ä, ö, ü, and the ß (double-s). Deference and politeness is expressed by the switch between formal ‘Sie’ (3rd person plural) and informal ‘du’ (2nd person singular). There are many German words that are same (almost same) as in English: Winter/winter, Haus/house, trinken/drink, etc. So it makes it a bit easier to learn. The verb is inflected to show person, number, tense, and mood; and the subjunctive is frequently used. So be ready to learn different verbs’ endings. There are four cases: Nominative, Genitiv, Dativ, and Akkusativ. There are 6 basic verb tenses in German. There are two simple verb tenses, which are formed using only the verb or its root or a derivative: the present tense and the simple past tense. The other four verb tenses – the future tense, the present perfect tense, the past perfect tense, and the future perfect tense, are compound tenses, meaning that they are formed using a helping verb + the verb’s infinitive or past participle. There are three grammatical genders: masculine, feminine, and neuter. German has loads of super long words. For example, the English “history of antiquity” is translated into German as Altertumswissenschaft; the English “worthy of distinction” is translated as auszeichnungswürdig. If you only start learning German and have no idea about grammar and sentence structures, learn the most basic words. This strategy will help you have a starting framework in which to place the nouns, verbs, and adjectives you will learn later. You can already do it at home, so that when you come to Vienna you will be able to communicate with people. You can start with important singular words and phrases, like “yes”, “no”, “please”, “thank you”, “my name is”, “how are you?”, etc. Then it’s time to move on to basics like “I am” (Ich bin), “You are” (Du bist), “He/She is” (Er/Sie ist), etc. It’s the very basic grammar. Start with this and it will be easier to understand how verbs change in other cases. Learn a noun with its gender. As you already know, German has three grammatical genders: masculine (der), feminine (die), and neuter (das). Not knowing whether a word is der (masc. ), die (fem.) or das (neut.) can confuse listeners and makes you sound ignorant and illiterate in German. Learn basic verbs. For example, to be, to have, to say, to do, to get, to stop, to go etc. This will help you to connect nouns that you already know! Remember that German verbs are conjugated. You will need to learn the basic conjugation systems while you are expanding your vocabulary. Learn adjectives. Once you have some nouns and verbs in your head, it’s perfect time to learn some adjectives, so that you can make your sentences more complex. Adjectives are also subject to a case system, so be sure you understand the basics of this as you learn. Get a good dictionary. It’s even better to have German-German dictionary as a foreign language. German has many synonyms and it may happen that the online translator won’t explain the differences and meaning of words. When you build basic vocabulary, you can have a look at simple sentence construction. Get a basic idea of how sentences are constructed. This will not be too difficult, as German is very similar to English in this matter. On this level you can already try to speak as much as you can. Try to use short sentences to decrease your chances of making a mistake. Find German speaking friends. The easiest way to do it is to use Facebook. Read a lot. As long as you have basic vocabulary and understand simple grammar rules, it’s time to develope it and have a look at more complicated things. Therefore, start reading simple texts. Another thing that you can already start doing at home is to have a look at online German lessons. There are loads of websites that can help you start learning German for free. The best way to find which resource is best for you is to simply try. This is awesome website that will help you to understand basic grammar and learn new words. Each lesson has few steps: grammar rules, exercises, examples of using certain rule and wordlist. 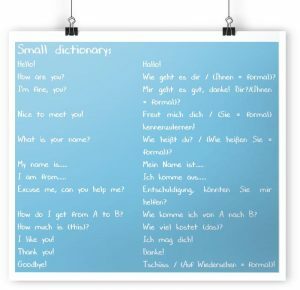 Here you can start learning German with listening and working on your pronunciation. Also it’s good for learning basic common phrases in German. This website is also good if you want to learn German starting from very basic topics, phrases and sentences. On BBC website you can find some facts about German overall and also to watch free video tutorials. This website is gold for those, who already knows German grammar basics and want to improve it. Here you have loads of grammar topics and audio course that will help you to improve your “weak spots”. It is a flashcards app. You can create your own decks or choose from pre-made options sorted by subject. This app teaches German through a multi-level approach. There are six types of exercises: repeating the recorded sentence spoken by a native speaker, translating a sentence or phrase from English to German and German to English, matching a picture to a word, etc. Another memorization-based app, where you can earn points while you learn, you can also compete against friends, and rate other user-generated lists. Memrise also includes thousands of programs, so once you’re finished learning German, you can move to another subject. 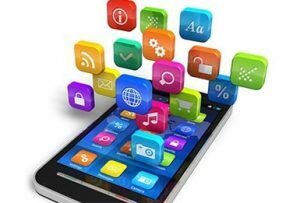 The app’s courses are based on the CEFR framework and cover all areas of language acquisition (reading, writing, speaking, listening). It is a pronunciation app that uses photos. It includes an instagram mode that pulls photos from instagram instead of the app’s database to keep things fresh. Vocabulary app. This app begins with German phrases, therefore might be a bit difficult for absolute beginners. This app is divided into levels (A1-C2), textbooks, and themes. It tracks your learning statistics and includes 22,000 grammar and vocab exercises and over 800 hours of interactive online courses. This free app can be used with or without an internet connection, and focuses on vocabulary. Sixty-three lessons cover topics ranging from greetings to clothing to sports to computers to religion. The app’s content is ordered by theme: greetings, eating, health, shopping, hobbies and much more. App for German verb conjugations. Verbs and nouns change a lot within sentences according to case, number and gender. If you have a hard time figuring out how to correctly form verbs across the different tenses, this is the app for you. App has a collection of flashcards divided into eight decks, one for each of the German tenses. As you see,learning German can become a real challenge. But don’t worry. You will be able to find many options how to do it fast and easy here in Vienna. Just check out our step German courses in Vienna. We advise you to start learning German as soon as it possible. You can do it even before moving to Vienna. Just use links we showed you and start with simple words and phrases. 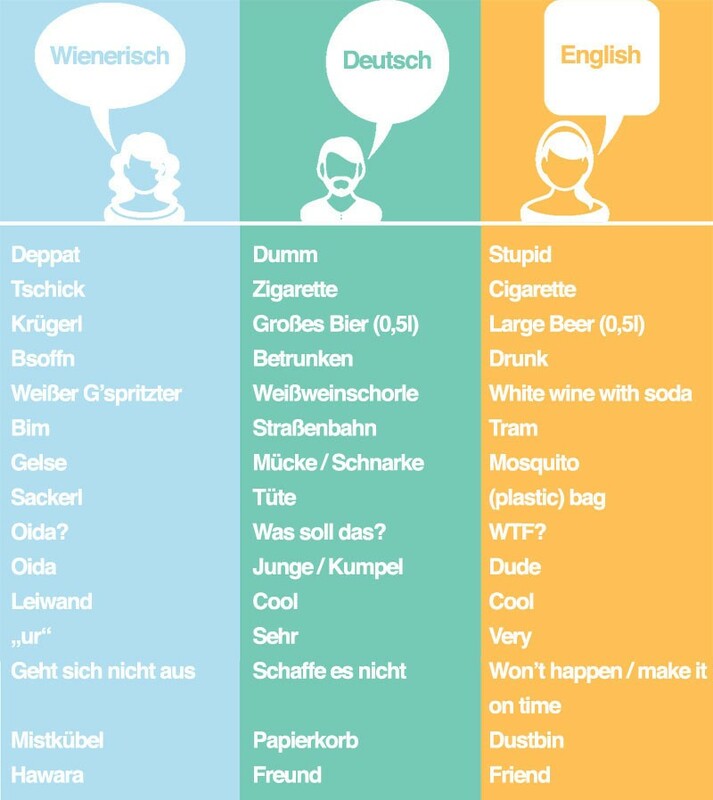 And one more thing that you should know is the difference between German and Viennese!